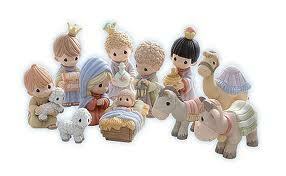 grandma's cookie jar: It's Time to Think about Christmas - a Nativity Set for Your Grandchildren! It's Time to Think about Christmas - a Nativity Set for Your Grandchildren! The first year my husband and I were married (thirty six years ago), he got me the Precious Moments Nativity Set for Christmas. I love setting up my Nativity Set each year - we set it up when we put up our Christmas tree after Thanksgiving dinner. We have a bay window in our living room, which is where we put our tree; I put the Nativity Set in the window as well with the kings traveling across the living room to the Nativity, because I want the focus to be on the Reason for the Season. So, when I saw ideas for making your own Nativity set on Pinterest, I thought it might be fun to let my grandsons make their own set over the weeks leading up to Christmas! Each week they could add to their set by making additional pieces to take home. Save empty medicine bottles and/or paper towel tubes, gather some scraps of cloth, make circles for faces and you are ready to begin creating! Celebrate Christmas all month long with your grandchildren and keep their focus on what really matters . . . Jesus!